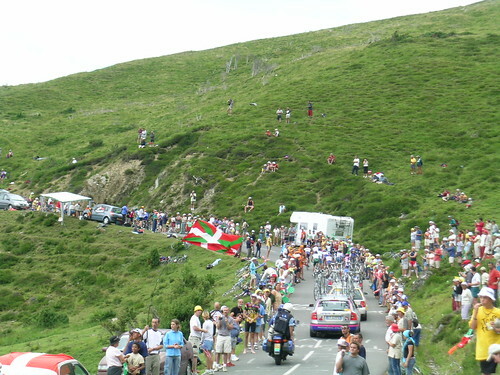 Today was the day we say our last stage of the Tour de France for this trip. 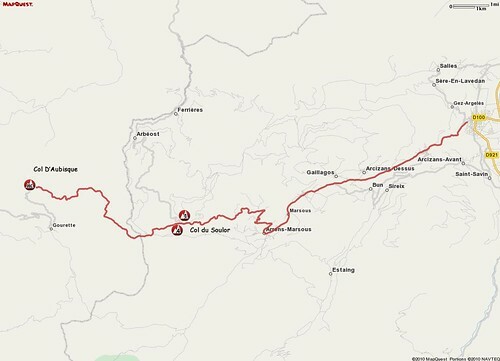 We left the Hotel Modern fairly early and headed for Argeles Gazost to look for a place to ride from. We drove around a bit and found that traffic was a mess. We ended up looping back around and found a spot back by the main road where we could park the van. 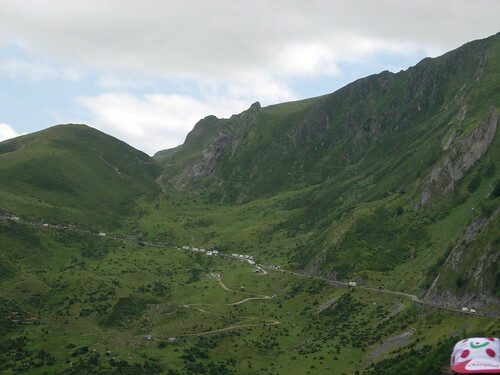 One of our ingoing jokes was the TREK Cycling Tour company which had a group staying at our hotel It seemed like a lot of the folks probably shouldn’t have been climbing these mountains as they clearly were struggling whenever we saw them. 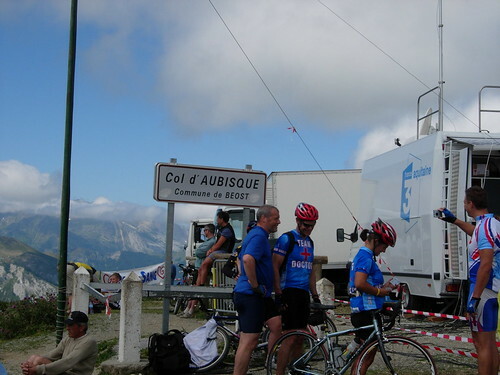 Additionally, they all had the best equipment and brand new shiny bikes that were provided by the tour company. 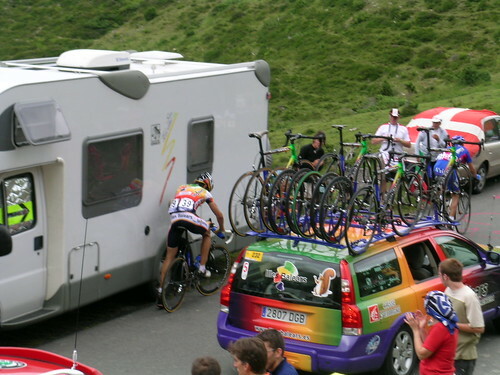 Yuppy bikers …… we would see than all day on this climb as they parked right near us in the lot. 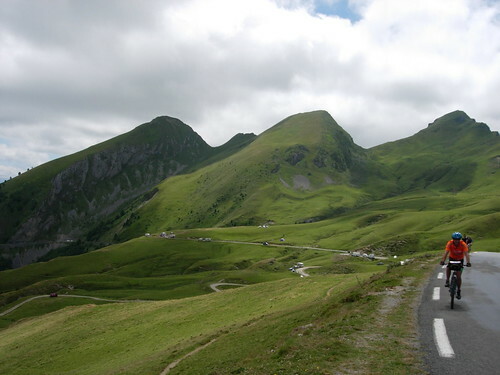 In general, the climb up the Col du Soulor and the Col D’Aubisque from this side was pretty easy … until we reached about 7K before the summit of the Col du Soulor. 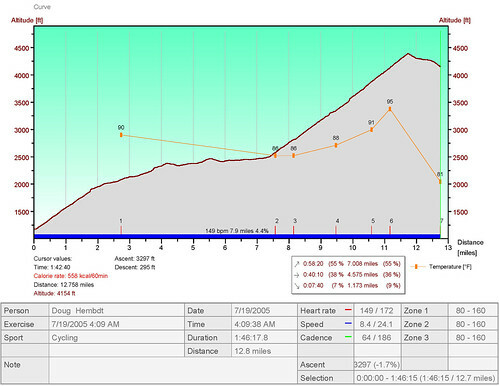 Here the climb got pretty steep and it was here that we flew past most of our friends from TREK Cycling chuckling at the poor guides trying to talk their clients up the hill. Perhaps that was rude, but it was hard to not laugh at the lies that we’re being told to keep them riding onwards. 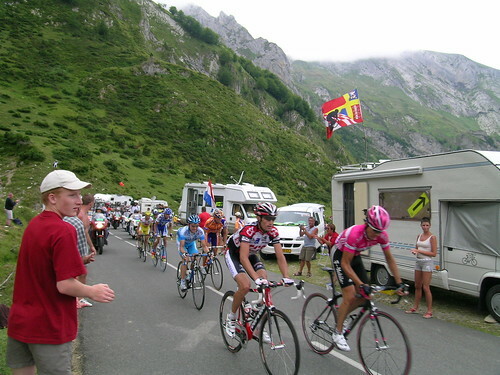 As we approached the top of the Col du Soulor, the crowds thickened considerably. 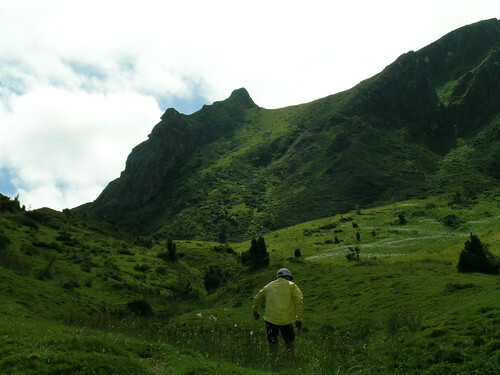 We continued over the top and headed down the short descent on the other side to find sme beautiful scenery and a nice elevated meadow that was perfect to watch the race come off the Col D’Aubisque and head up the Col du Soulor. 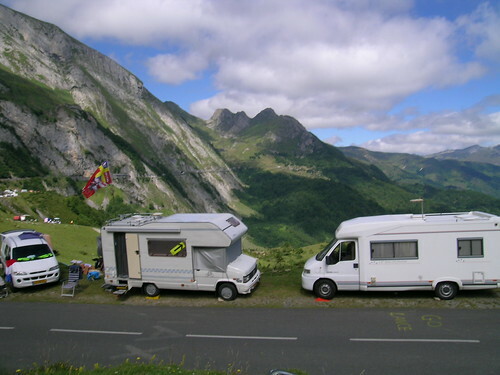 Paul and I decided to stop here and camp out and Tom continued onwards up the Col D’Aubisque to the summit. When updating this page with better images, I came across this little video clip. The resolution isn't great, but it shows some of the pre-race festivities. 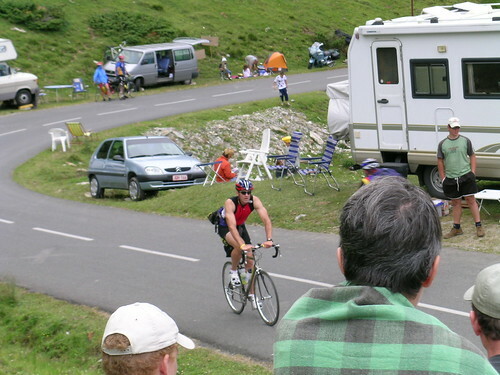 It was taken where we watched the race, in the valley between the Col du Soulor and Col D'Aubisque. 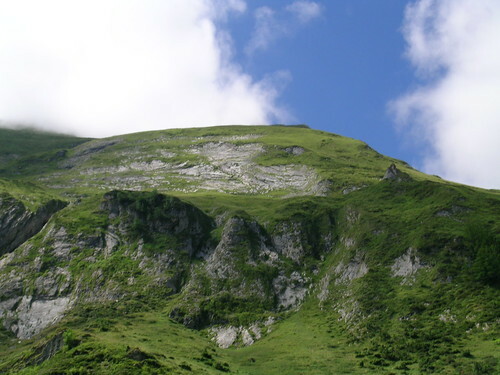 Tom made it to the summit of the Col D’Aubisque and the views were spectacular. 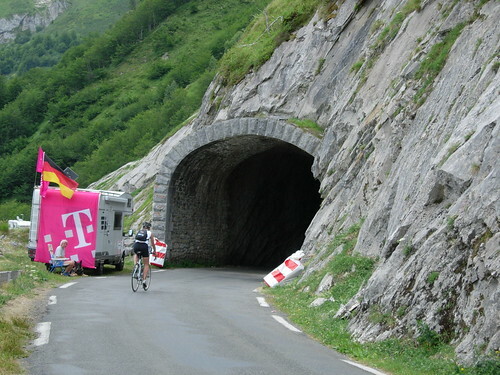 One of the more interesting things Tom said we missed were the tunnels on the Col D’Aubisque. 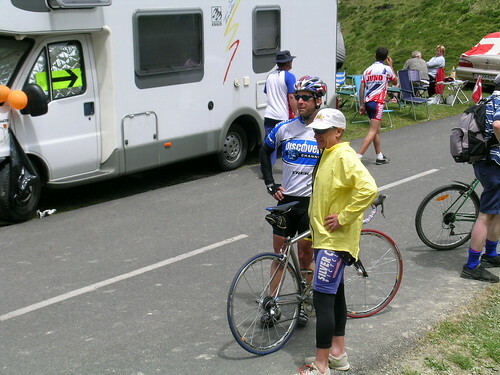 Meanwhile, Paul and I hung around on the Col du Solour and waited for the race, watching the crowds. 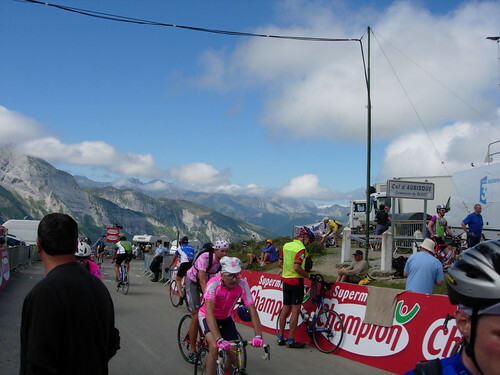 Finally Tom returned form his journey and said he had seen Vigo on the Col D’Aubisque. Next came the caravan and we definitely grabbed some swag this time around. 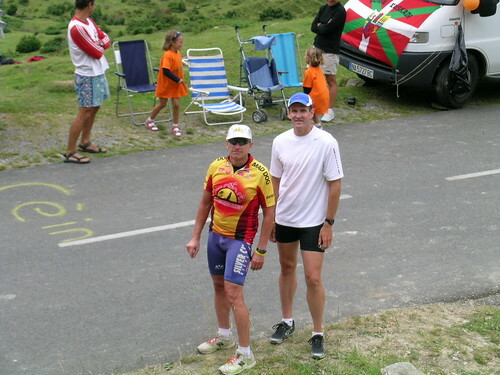 Here are Paul and Tom getting ready to fight the kids on the side of the road for the goodies. 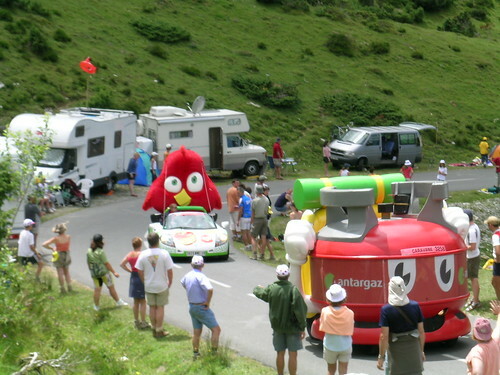 More crazy caravan vehicles in the mountains. While waiting we ran into Wayne form Wales again. 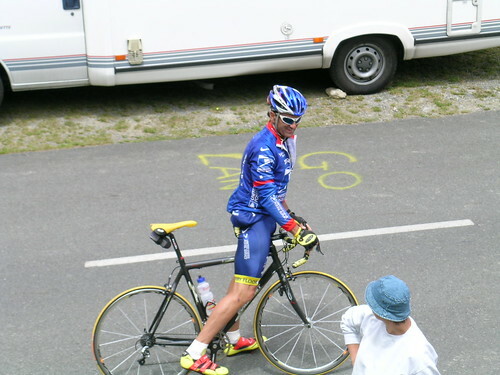 He had ridden his bike from Lourdes vs driving to the mountain like we had. Turns out there was a bike path so we could have ridden the whole way also. 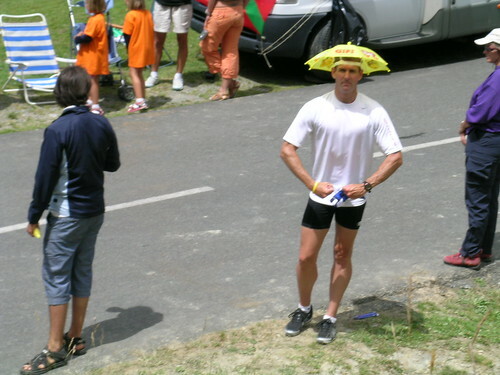 Tom getting into the spirit of the caravan. 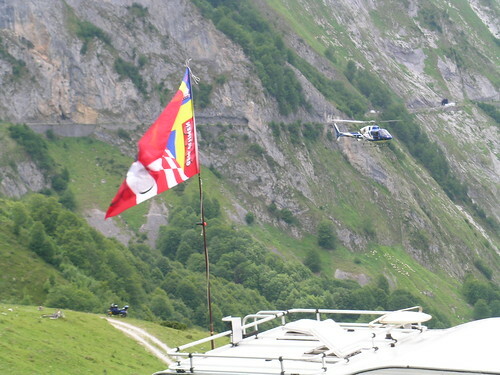 Finally the Helicopters came and so did the race leaders. 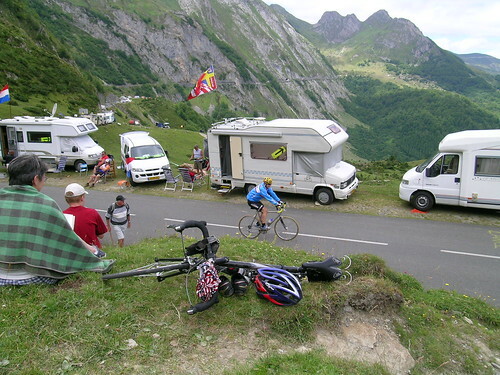 This Iles Ballearas rider has some difficult and crashed into the camper at the side of the road. 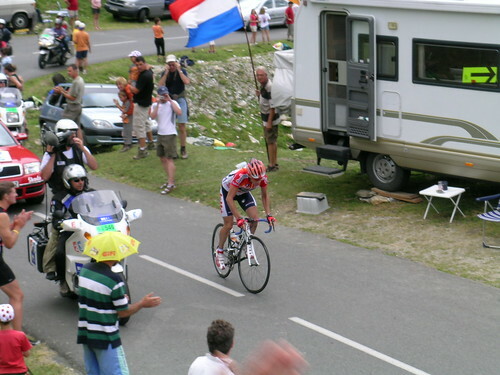 After this, I went to the road level to wait for Lance to come by. 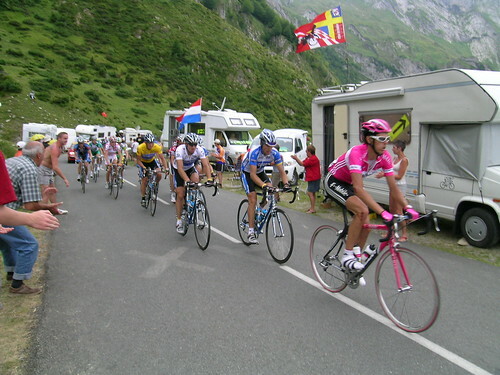 Soon in the main pack came by that included Lance, the Discovery support, Kolden, Ullrich, and Basso. I could look into Lance’s eyes as he passed … pretty cool. After the sweeper vans passed, the crowd started massing for leaving the area. In some ways this should have been easier than the mountaintop finished we saw previously, since there were multiple exit paths. 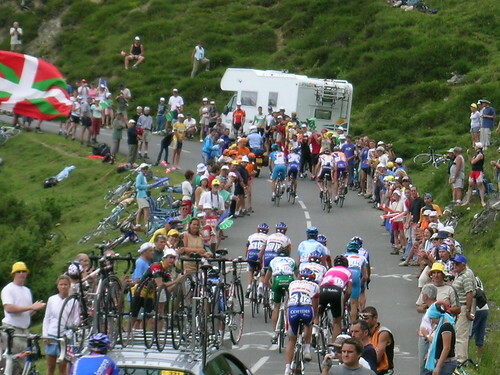 Unfortunately, it seemed everyone was heading out way as we were able to climb the Col du Soulor .. partially by dodging other riders and partially walking. 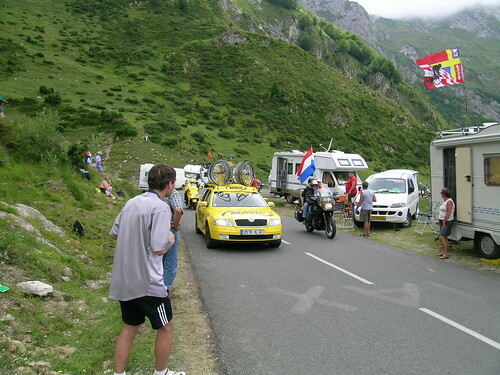 The decent off the Col du Soulor was even worse as we had to ride in a massive pack down the first few kilometers. It was chaos trying to follow people without hitting them, trying not to crash into people next to you and trying to not be pushed off into the gutters in the side of the road. Finally we were able to break free after about 4K and after that, we rode a relatively quick pace all the way downhill to Argeles Gazost. When we got to the parking lot, we discovered that the Custom Getaways tour bus had parked near the lot and hence we ran into Max, Vigo and the Maryland guys again. 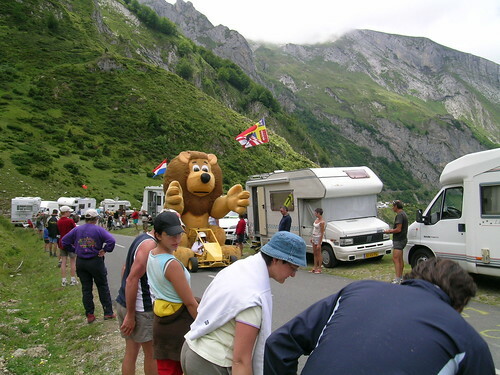 Finally we saw the Maryland contingent come back from their ride up the Col D’Aubisque. They were heading back to the summit of the Col du Soulor where they were part of a cookout put on by the Custom Getaways tour that they were traveling with.